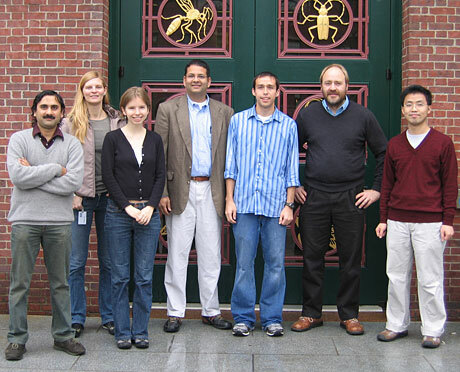 Co-authors and contributors (l to r): Vishal Trivedi, Eva-Maria Frickel, Martha Gorczyca, Jatin M. Vyas, Adam B. Costoreno, Axel Nohturfft and Shao Chong Zhang. Around the turn of the 20th century an epic controversy was fought on the question of how the body defends itself against infections. In one camp were the ‘cellularists’, led by zoologist Elie Metchnikoff, who believed the principal instruments of the immune system to be white blood cells that engulf and digest invading microorganisms. Their opponents, called ‘humoralists’, disagreed and argued instead that the chief weapons of the immune system were soluble molecules called antibodies. “[…] Sir Almroth Wright, following up on Metchnikoff’s most suggestive biological romances, discovered that the white corpuscles or phagocytes […] do their work only when we butter the disease germs appetizingly for them with a natural sauce which Sir Almroth named opsonin […]”. Amoeba-like phagocytes are our first line of defense against microbes that enter e.g. the lungs during breathing or the skin when you fall and scratch your knee. Phagocytes can swallow microbes whole and store them in intracellular bags called phagosomes where the prey is slowly digested. If an infection persists other cells of the immune system will mount a second line of defense and begin to secrete molecules that potently stimulate the ability of phagocytes to do their work. And among these stimulants are the humoralists’ antibodies. Following their discovery by Behring and Kisato in 1890, antibodies were found to be globular proteins comprising different classes, the most important of which is referred to as immunoglobulin G, or IgG. Our immune system produces billions of different IgG antibodies, each of which can avidly bind to another foreign molecule. IgGs have two domains. One domain binds foreign invaders, while the other is recognized by specific receptors on the surface of phagocytes. IgG thus enhances the recognition of microbes by phagocytes and potently accelerates their engulfment. Following Sir Almroth Wright’s suggestion, IgG and other phagocytosis-stimulating “sauces” are still referred to as opsonins. In addition to “buttering” germs for phagocytosis, antibodies prevent disease by neutralizing bacterial toxins, a function that is crucial for example in the body’s defense against diphtheria. Another trick up the sleeve of the immune system is the ability of phagocytes to produce their own toxins to kill microbial intruders, a process strongly enhanced when microbes are covered with antibodies. In a paper appearing in the November 28, 2006 issue of the Proceedings of the National Academy of Sciences we are now describing yet another aspect of IgG’s ability to promote the destruction of foreign particles. When IgG binds to receptors on phagocytes, a signal is transmitted to the cytoplasm that activates the merger of phagosomes with lysosomes, vesicles that carry enzymes required for killing and digestion of phagocytosed germs. We speculate that IgG-induced activation of the lysosome/phagosome targeting pathway is particularly important in the defense against intracellular pathogens, a group of germs that cause disease by growing inside phagocytes. The project was led by postdoctoral fellow Vishal Trivedi with help from Shao Chong Zhang, Adam B. Castoreno, Walter Stockinger and Eugenie Shieh from Harvard/MCB and Jatin M. Vyas and Eva-Maria Frickel from Massachusetts General Hospital and the Whitehead Institute.